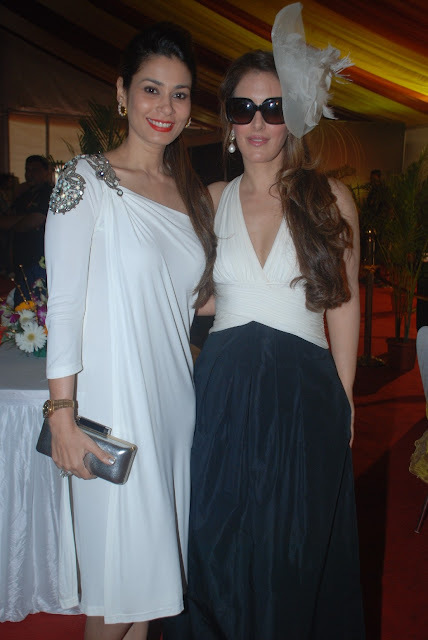 This saturday, the McDowells Signature Premiere Indian Derby witnessed an extravagant fashion show by International Designer Pria Kataaria Puri showcasing her striking collections Chic Daywear and Glam Diva leaving the audience spellbound. This rocking and packed do un-wrapped with a peppy performance by an upcoming singer keeping the audience amused as gorgeous models graced the ramp with chic ensembles of designer Pria Kataaria. An eclectic mix of fashion pedants and socialites like Tanaz Doshi, Yohan & Michelle Poonawalla, Delna Poonawalla, Krishika Lulla, Shaheen Abbas, Nisha Jamwal, Achala Sachdev, Vardha Nadiadwala and many more were seen cheering and applauding for their dear friend Pria. Tanaz Doshi turned up in a trendy Pria Kataaria outfit with her signature style and complete sophisticated look.